The nights are drawing in and the weather’s getting less predictable- we must be approaching the end of the triathlon season. 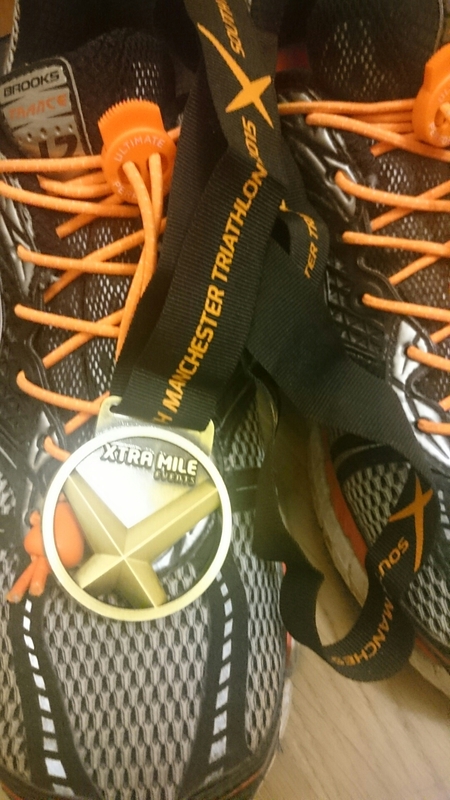 Today I competed in my last triathlon of the season- the Xtra Mile Events South Manchester sprint triathlon. Set in Wilmslow, the triathlon featured a 400 metre pool swim, 24km cycle through country roads and a 6.4km run through housing estates, across busy roads and down quiet back lanes. The swim start was in waves with a 10-15 minute gap between waves, with up to four swimmers in a lane, departing with ten seconds between each. In my lane I was fourth to set off. Having spoken to the other swimmers in my lane, I had the slowest anticipated swim time by 30 seconds. However, I found that the first three swimmers caught up with one another and I in turn caught up with all of them. There was no point tapping the soles of the swimmer in front as we ended up all moving at approximately the same pace. After 16 laps we followed each other out of the water and I felt light on my feet running into transition. I wasted no time going through transition and mounting my bike. There were plenty of potholes to negotiate but overall I was pleased with the route and I gradually overtook cyclist after cyclist, only being overtaken by two. I soon caught up with riders from the previous wave and made progress through their numbers. At one point a peleton of club riders heading in the other direction cheered us on. Despite being a longer than average ride for a sprint triathlon, the time flew by and before I knew it I was back at transition, where I quickly changed shoes and set off into the run. Not the most appealing run, but soon I had another triathlete breathing down my neck. We spent the second half of the run jostling for position, with him drawing along side me, overtaking, before I reigned him in with the finish line ahead. I can’t honestly say who crossed the long first- I think the photos will tell. Fortunately for me as I’d started thirty seconds after him, I took position ahead of him, and a respectable position overall. All in all a great afternoon out and the ominous rain clouds held off. Thanks, Rossendale Triathlon club runner for pushing me to run harder! Thanks to the Xtra Mile staff and volunteers for a great race, and to the considerate drivers in the area who gave me a wide berth on the fast roads.